Yummy Vegetable Fried Rice Recipe Explore the taste of Yummy Vegetable Fried Rice Recipe. This dish is healthy, tasty, and easy to make. It is prefect for any occasion. 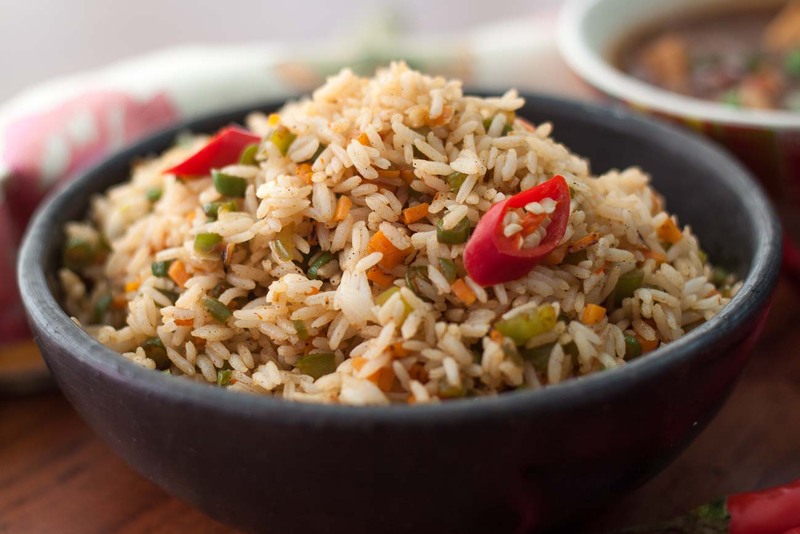 Vegetable Fried Rice is a popular Indo- Chinese rice dish which is loved by all. This dish has a nice crunch of various vegetables and also has a wonderful flavors of various seasoning. It is an excellent option for weekend dinner. It is a quick, healthy, attractive, colorful and tasty dish which is a hit with kids as well. Try this yummy rice dish at your home. 1.In a deep pan, pour 6 to 8 cups of water, add salt and 1 tablespoon of oil and then add the rice to the boiling water and cook till the rice is 85% cooked. 2.Once done, switch off the flame and pour into a colander (perforated vessel) and let the water drain out from the rice and pour some cold water on the rice to stop further cooking. 3.Add the 1 tablespoon of oil and toss the rice in it and spread the cooked rice on a flat surface and keep it aside to cool. 4.Heat the oil in a wok / kadhai, add the cabbage, spring onion whites, french beans, carrots, celery and capsicum, mix it well and fry on a medium flame for 3 to 4 minutes, and stir occasionally. 5.Add the salt, rice and soya sauce, mix well and fry on a high flame for 2 minutes and stir occasionally. 6.Add the five spice powder or pepper powder mix it well and cook on a high flame for 1 minute. 7.Add the spring onion greens, mix it well and cook on a medium flame for 1 minute and switch off the flame and serve it with baby corn Manchuria. Yummy Vegetable Fried Rice Recipe Food Recipe Indian Recipes Dinner Recipes.